Experience the everlasting appeal of a 3-hand watch with a modern twist. 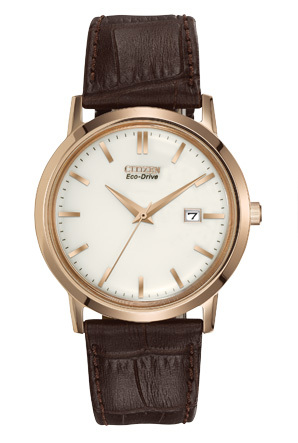 The slightly oversized, elegant 40mm rose gold-tone case with ivory dial, stick markers and date window are enhanced by the rich brown leather strap. Boxed crystal provides the perfect window through which to view this handsome timepiece.